Use cases and descriptions for using Blackboard Collaborate with small groups. Examples: Undergraduate Seminar, Graduate Seminar, Instructor Meeting, Dissertation or MA Defense, Advising Meeting/Online Office Hours, Review Session, Student Collaborative Work Space. Tools Needed: Video, Audio, Whiteboard, Application Sharing, Web Tour, Chat, File Transfer, Break Out Rooms, Polls, Timer. 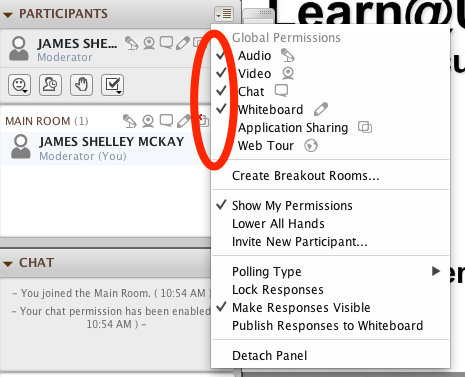 Student or non-moderator Permissions needed: Whiteboard, Chat, Video, Audio. Recommended Organization: For small groups you can opt to either try to stay on top of permissions and other technical issues yourself, or have a second moderator to take care of the technical side while you deal only with the content. Until you are comfortable with running sessions on Collaborate, we recommend that you have a second moderator if possible. To ensure the session runs smoothly, log-on 15-30 minutes early to set-up audio and video, enable permissions and load content. Setting up Audio and Video: To set up your audio function, click on the “hamburger” button on the top right of the Audio/Video panel and select “Run Audio Wizard.” This will walk you through setting-up your audio. To set-up the video, click on the video button at the bottom-right of the panel. You can also preview the video without participants seeing it by clicking on the preview button next to the video button. If, however, you have a more structured session in mind, then you will want to manage individual permissions throughout the session. 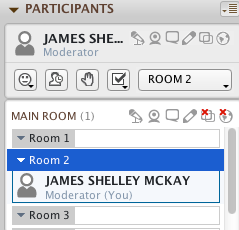 This is when having a second moderator to handle technical issues is most helpful. Each individual has a set of permissions. You can over-ride a global permission for the individual by clicking on the individual tool above and to the right of their name. A red x indicates the individual permission for that tool is off. If you are planning on having more than six people in your session use the video and/or audio tools at some point or if more than one person needs to control the Whiteboard, Application Sharing or Web Tour tools you will need to rotate those permissions. Collaborate only allows six simultaneous videos and audio streams. You can rotate permissions in one of two ways. First, you can simply enable the tool, such as audio, for all participants and ask participants to turn off their tool when they are not using it, making sure that no more than 6 participants are trying to use it at the same time. If you want a fairly unstructured, free-flowing kind of meeting this is a good approach. The second way is to only give out the permission to the specified number of people at any given time. I.e., only allow six participants to have "audio" and "video" enabled at any given time. You can rotate those permissions by disabling an active participant's permission and enabling a non-active participant's permission. 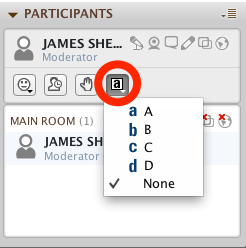 To rotate the permissions simply click the tool icon to the right of the active participant's name in the participant's panel until there is a red x through that tool. Then you can give that permission to another participant by clicking on the tool icon to the right of their name until the red x disappears. Similarly with the Whiteboard, Application Sharing and Web Tour you need to first turn off or disable the permission for that tool for the host moderator (which is you unless you overrode the default settings for the session). After you have disabled your own permission for that tool, you can then enable it for one and only one person. To begin Application sharing, click on the Application Sharing Icon at the top left of the Whiteboard. 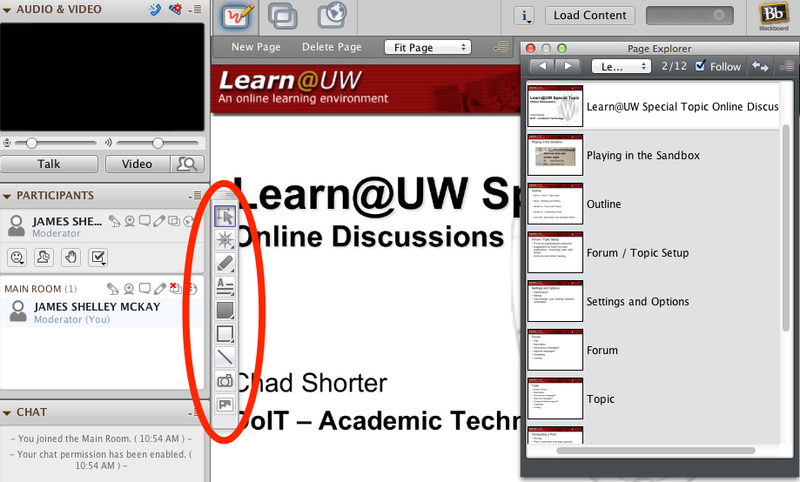 To start the Web Tour tool, click on the Web Tour icon at the top left of the Whiteboard. This opens up the Web Tour tool. Simply enter the URL of the website you want to go to in the box that opens up and hit enter. The Chat tool can function as a Q&A for large, non-participatory events. Non-moderators (students/attendees) can ask questions in the chat that the Moderator can then respond to either in the chat or through video/audio. To use the chat simply enter text into the text box and hit enter. You can also select emoticons by clicking on the emoticon icon in the text box. 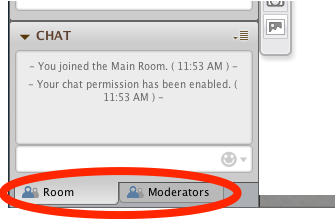 There are two default chats, one general chat that everyone in the web conference can see and one that only the moderator can see. 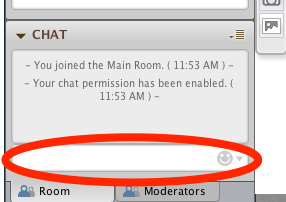 You can tab back and forth between the chats at the bottom of the Chat Panel. You can disable the emoticons, manipulate font size, send announcements and adjust other chat settings by clicking on the “hamburger” button on the top right of the panel. File transfer allows you to upload and distribute files to all web conference attendees. To upload a file to the file transfer library, click on file>open>File for Transfer. This opens the standard file browser of all the files on your computer. Simply select the file you want and hit “open.” This will then automatically open the File Transfer Library. 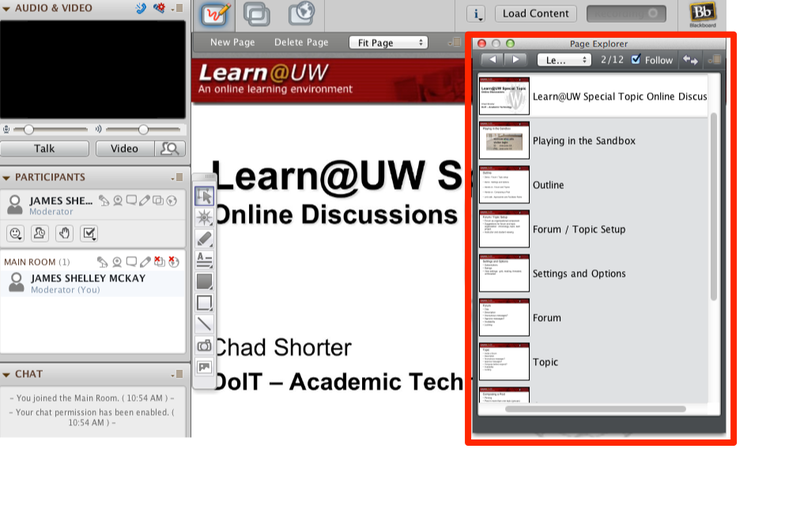 All files in the library are accessible to all web conference participants. Using the icons at the top you can save the file, remove the file, remind participants that they can download the file or add a new file. 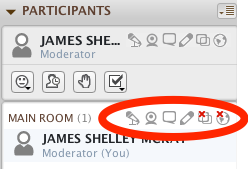 You can access the Break Out Room controls from either the “hamburger” button on the Participants panel (shown below) or by clicking on the Tools dropdown menu at the top of the screen. 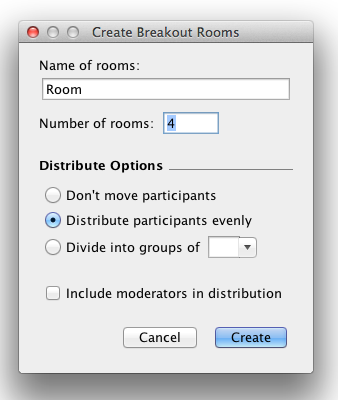 You can manually assign participants to breakout rooms by simply clicking on and dragging their name in the participants panel. You can also click the “hamburger” button next to their name in the participants panel and select a room to move them to. 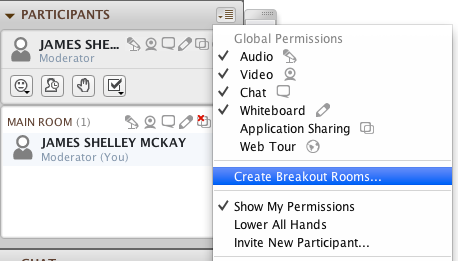 To access the individual breakout room’s controls simply click on the “hamburger” button to the right of the room name. From this menu you can do everything from renaming the breakout room to closing the breakout room to sending the entire room back to the main room. (Note: You may have to hover your mouse over the name for the button to appear). You can copy any and/or all Whiteboard pages from the break-out rooms to the main room Whiteboard. You can create a poll either by clicking on the global permissions "hamburger" button on the top right of the participant's panel or by selecting "Polling" from the dropdown Tools menu at the top center of your screen (shown below). You can select one of 4 different poll types; a Yes-No option, an A-C option (3 possible answers), an A-D option (4 possible answers), and an A-E option (5 possible answers). When you create a poll, you need to either tell participants what their choices are (click A for this response, B for this one etc. ), post the choices in the group chat or both. From this same menu you can also select "Publish Responses to Whiteboard" which posts the poll results on the Mainroom Whiteboard. 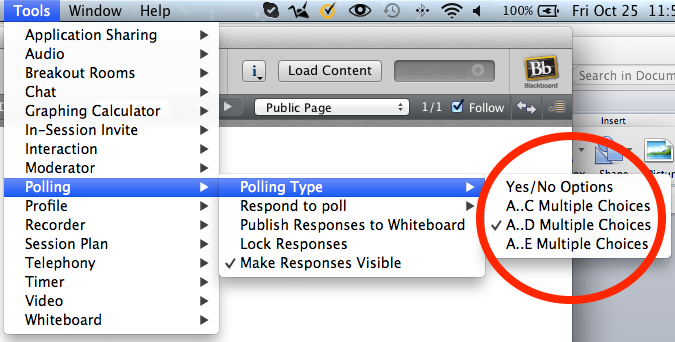 (Note: "Make Responses Visible" is a default setting that allows anyone to see how a particular participant voted by looking next to his or her name in the participant's panel) Participants can vote by clicking on their choice from the dropdown menu under their name in the Participant's panel. This is also where the poll results will show up for you as the moderator. You can set a timer that all participants can see count down for anything from a break-out room session to timing a poll. When the timer goes off it emits a beep as well as sends a notification to all the participants. To start the timer simply select “Timer” > ”Start Timer” from the “Tools” dropdown menu at the top center of your screen. The Timer appears above the Whiteboard.